I’ve had some kind requests to share my lesson plan template…this is the one shown in my All-in-One Teacher Binder post. I’ve used this template for the past few years and it has worked really well for me. It’s pretty self-explanatory, but I will tell you a lot of thinking did go into it!! The sidebar on the left is for the subjects/activities that require little information, just notes about lunch duty, homework, etc. 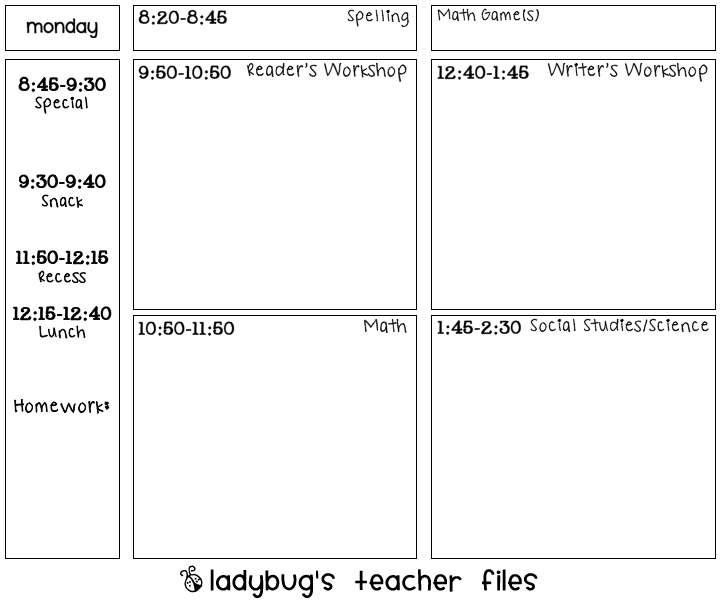 The top bar is to keep track of our spelling unit and activity for the day, as well as the math game(s) we’ll be using. And the four larger boxes are for the lesson plans in all major subjects. We are not required to write any specific sort of lesson plans in our school–just to document what we do in each subject. This amount of space has been just enough for me to pencil in our day. And speaking of our day, I really do love this whole day-at-a-glance layout! I have tried so many variations over the years…a week at-a-glance, a day written out over two pages…but I was never really happy with them. This one is great for me because I can have my binder lying open and see everything at once–in case I need to refer back to my plans. And it only uses 5 pages for the week. So…I am sharing this file as a Word document, that way you can modify as needed (if you are interested in this template). I know this won’t be for everyone, because lesson plan templates are so personal…it’s really important to find one that works for you and it can be hard to do so. If you are searching for that perfect template, my good friend Ms. M. has a wonderful array of lesson plan options at her blog, A Teacher’s Plan…and she even does customized orders, which is so cool. That girl has quite the knack for colorful, organized, and eye-catching lesson plan templates–you must check them out if you haven’t already! How do you like to organize your lesson plans? Have you used the same system for awhile now, or do you evolve your plans each year? I hope some of you can adapt this one! Thanks for the inspiration and the should out! Yay!! Thank you so much for posting this! I have checked back frequently and was so excited when I saw this. I did not get a chance to post a thank you the other day, but better late than never!! I love your site and can not thank you enough for all your help and inspiration!! I can't get the day at a glance to open. Can you post the link? Your site is great. Do you have any ideas for a homework template with ladybugs on it. I'm using bugs as my theme throughout the school year. Thank you! This lesson plan was needed inspiration. I saw it while looking at the teaching binder and was so excited to see the template available! Thanks so much for sharing it and all your wonderful ideas! I am not able to open the link to the lesson plan template. Any idea why? I love the all in one binder and the lesson plan template. Nice and easy to follow. Hi Donielle, Are you using Internet Explorer? Browsers like Safari, Firefox, or Google Chrome have an easier time opening files on the net. Thank you for this template! I love the idea of using the space for content only–I was dedicating way too much space to recess and lunch. Your site is fabulous! Thanks for all of the inspiration :). I appreciate you sharing this. I liked the idea so much that I made my own version in PORTRAIT rather than LANDSCAPE and I personalized each day of the week. I loved the idea as I had been looking for a way to write out only my necessary plans per day, rather than whole lesson plans. Thanks!